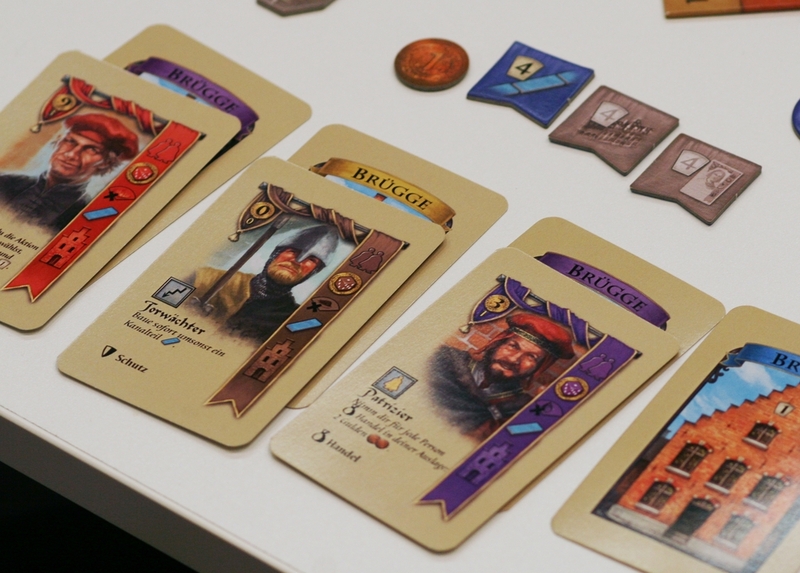 Bruges is essentially a card game passing off as a board game. This means the gameplay revolves solely around the cards in the game ( and there are many ). 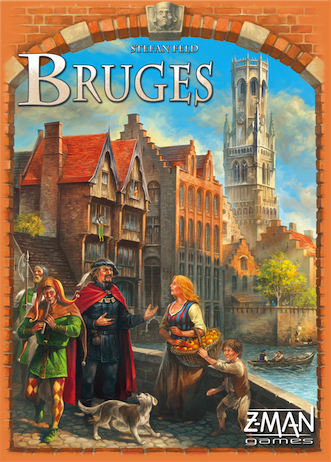 Bruges is surprisingly easy to teach, with the main hurdle being all the effects / abilities of the different cards in the game and how they work with each other. Each round consists of 4 phases. In the first phase, each player simply draws cards until he/she has 5 cards in hand. The trick in this phase is that each card is divided into 5 different colors. And though the front of the card is hidden, the back of the card tells the players what color the card belongs to. So when players draw their cards, they will be drawing from 2 different stacks ( or just 1 stack if they so decide ) with full knowledge on what the color of the two cards available to them are. This is important as the colors affect the actions that he player may execute with the card in hand. In the second phase, the start player will roll 5 dice which match the 5 colors of the cards. The only numbers that matter are the 1s, 2s, 5s and 6s. On whichever color dice that shows a 5 or 6, each player ( without exception ) must take a threat marker of that particular color. Once a person collects 3 threat markers of the same color, a negative event will happen to them. As for the 1s and 2s, they will be added together and that is the amount of money that a player may pay to advance on the town hall track. The town hall track rewards you with points at the end of the game. The third phase is where you will find the meat of the game. In turn order, each player plays a card until everyone has played 4 cards, then the phase is over. With one card, a player may perform up to 6 different actions. Just a simple description of how the various actions can benefit the player. The thing that makes each game different is how you use the ability of the character you recruited. Each character gives you an ability or effect that either happens immediately, or is an ongoing ability, or is an ability that requires activation. It’s the mixing and meshing of the abilities that determine how well you do in the game. Some characters give you end game points based on “set collection”, others give you abilities that allow you to bend the rules in certain situations ( drawing cards, advancing on town hall, etc ). This is the reason why explaining how the game plays is easy, but preparing the players for the cards that are to come out is nearly impossible. ( reputation, people, canal ). The player who is the sole leader in any of the 3 may immediately flip a tile that will score him/her points at the end of the game. Once flipped, it remains flipped for the rest of the game. So basically, players are trying to have the majority in each area at least once throughout the course of the game. This happens round after round until one of the draw deck runs out, that signals that the current round is the last round. After which, points are tallied, and the player with the most points is the victor. I love games where a card may be used for multiple purposes. This makes the decisions harder as compared to a card with purely one use. Due to the multitude of different card types and abilities, this can lead to several combos between different cards. This makes each game different and allows for players to try different approaches to winning the game. Bruges seems to be a simple game to pick up as the rules and flow of the game is pretty straightforward. But like most typical Feld games, it gives me the impression of wanting to do everything all the time. I really like this aspect of his games and is probably why Bruges appeals to me as I see most of the actions available being interlinked through a cost and reward system. The implementation of the threat markers is a cool feature I like in the game. It is almost always avoidable as you only get one threat marker of a color maximum each turn. So you could spend the previous turn trying to reduce your available markers to 1 instead of being on the brink at 2. But, being the gambler I am, I like the option to push my luck that the dice rolled will not produce a 5 or a 6, and thus instead of using an action to mitigate the threat, I could have used it to further my advancement to victory. Its not a big part in the game, but I welcome that little form of randomness. As much as I like the randomness in the dice to determine the threat probability and the amount to pay for prestige points, I am quite concerned over the randomness of the card draw. All the cards are different, and their abilities varied, so a poor draw can really set you back the whole game. Or being unable to draw a color card that you want could just lead you to sit there and mull the lack of options to do anything. 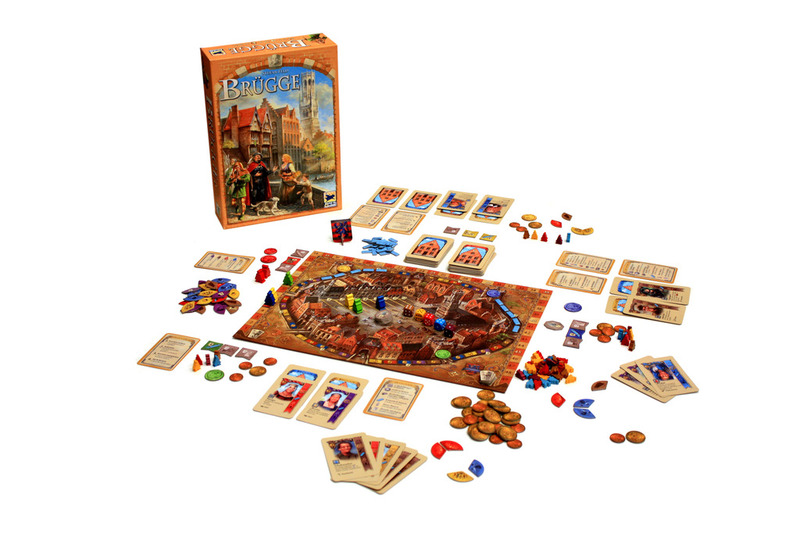 Unlike the other Feld games, there is no option in Bruges to “prepare” for a future turn by taking an action that allows flexibility for the next turn. This is probably my biggest gripe of the game. Bruges is the type of game where only with multiple plays will you be able to grasp a decent strategy for the game and know what to expect from other players. This is because of the different card types and abilities. On the first few plays, it will likely be just you playing what you have and not knowing what others can do to you or for themselves. Only with further plays will you know what to expect and how to counteract against the character cards of your opponents. This is good if your group is willing to play the same game multiple times, but sometimes, that really is not the case for me. It could be weeks before I play it again, and then it would be tough to get the game going as it is. Not sure if this will turn out to be the case, but I have a slight feeling that how you play the game is determined by what you have drawn from the deck. There is no option for open card drafting to decide what strategy you want to run, there is no way to peak at cards to determine what you may be getting, and there’s only 2 decks of cards to draw from. So in a way, you play the cards you get, and that is purely from drawing mostly blind as all you really know are the color of the cards. And some cards are not even used in the game ( especially with lesser number of players ). This could be a major spoiler for some people, and I think my group will have one or two who might be put off by this. I had really wanted to get this game when it was released. In Macao you can avoid punishment if you play well without going out of your way to focus on it. I wonder if Bruges can be played similarly? Instead of using cards to get rid of threat markers, can you plan in such a way that when the disasters hit, they have minimal effect? 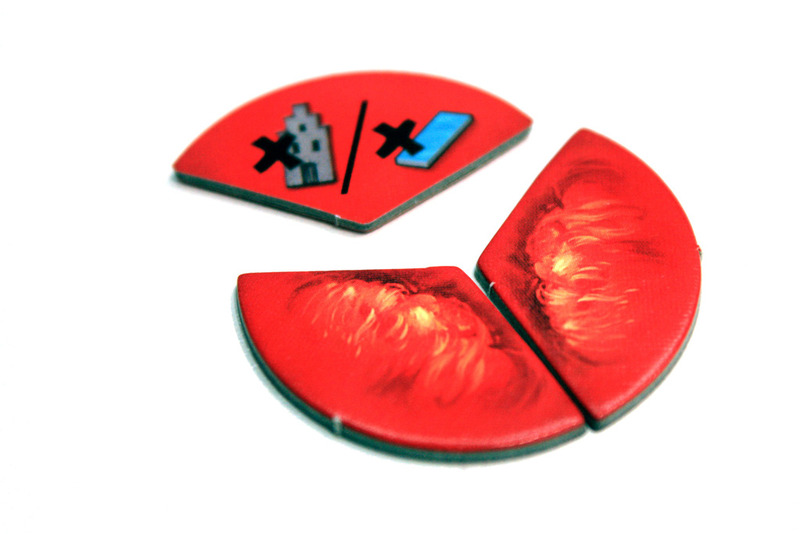 If you have 0 money when the "lose all your money" disaster hits, you save 3 card actions and get your yellow tokens reduced back down to 0. I am looking forward to more reviews on this game to see if this way of playing is possible(alongside the push your luck element you talked about). so if you have neither of the items to lose, the threat is passed and you discard all tokens to start from zero. so smart play and timing can save you from the imminent threat so to speak.